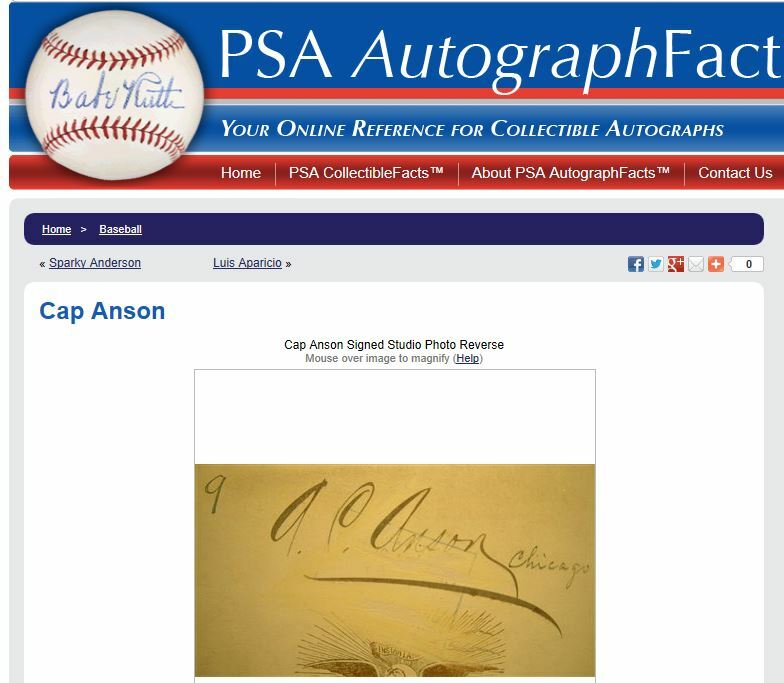 PSA/DNA includes a bogus signature of Cap Anson on its "Autograph Facts" page. The cabinet card shown is also stolen from the NYPL's Spalding Collection. Last winter a monumental PSA/DNA error was exposed after the authentication company included a bogus signature of Hall of Famer Smilin’ Mickey Welch as an exemplar on its online “Autograph Facts” section intended to aid and educate collectors. In addition, it was also determined that the signature displayed wasn’t just bogus (it was a period identification not a signature) it was also written on an 1888 Stevens cabinet photo that was stolen from the New York Public Library’s famous Spalding Collection. The Welch card had a handwritten numeral “9″ written on its reverse and the remnants of a defaced NYPL ownership stamp. The “9″ (written by researcher Charles W. Mears) signified the card was once housed in “Box 9″ of the library’s photo archive before it was stolen in the 1970s along with several other Stevens cabinet photographs. After the Haulsofshame.com report was published, PSA/DNA removed the Welch signature and cabinet card from the Welch “Autograph Facts” page. In our report we illustrated all of the NYPL Stevens cabinet photographs including the missing Welch example and four cards that had been recovered by the NYPL of Buck Ewing, Roger Connor, Mike Tiernan and Danny Richardson. Another missing Stevens cabinet of Cap Anson was illustrated and when displayed together all of the examples revealed that none of the cards were signed by the players, rather the cards featured fancy script period identifications of the subjects on the backs of the Stevens cabinets. This illustration was included in our report from early 2013 showing that a Mickey Welch cabinet card was stolen from the NYPL and that it was not signed by Welch. The handwritten names on the cards are identifications, not signatures. Despite having illustrated that all of these signatures are non-genuine, a review of the current PSA “Autograph Facts” page for Adrian “Cap” Anson reveals that PSA/DNA has also included the handwritten identification of Anson on the stolen cabinet card as an authentic exemplar of Anson’s signature. The Cap Anson cabinet photo illustrated by PSA on its "Autograph Facts" page has the same handwritten "9" written on its reverse along with a script identification of Anson, not a signature. 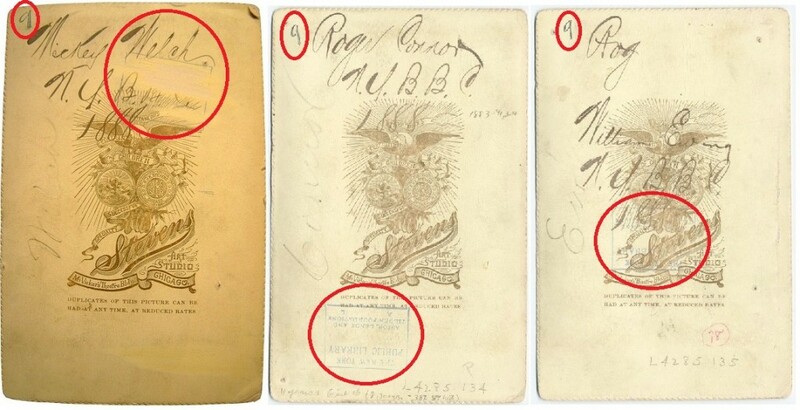 The larger space circled in red shows evidence of the removal of the NYPL ownership stamp which can be seen more clearly on the PSA website (inset). 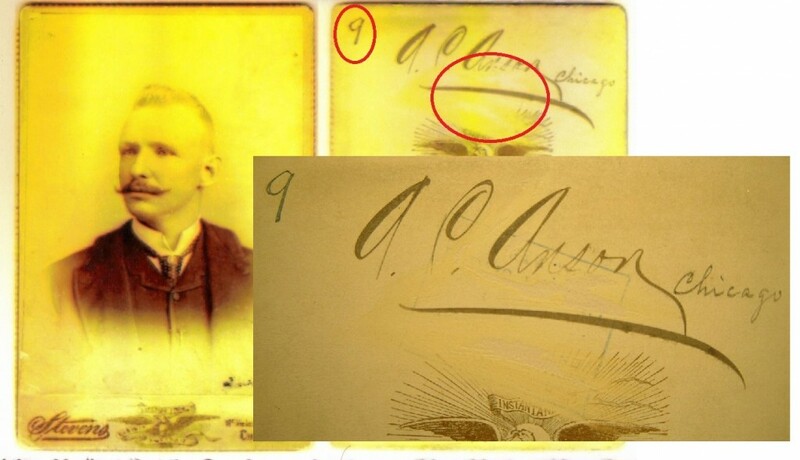 The handwritten identification was clearly placed on the Anson card by the same person who placed the identifications on the Welch, Connor and Ewing cards. It is definitively non-genuine, and stolen property to boot. Vaudeville theatre contracts alleged to have been signed by Cap Anson appear on PSA's "Autograph Facts" page and have been sold at auction with PSA LOA's. The PSA problems on Anson, however, do not end with the identification on the stolen Stevens cabinet photo. PSA also includes a signature exemplar found on a vaudeville theatre contract which is also a non-genuine example. The contract bears a secretarial signature signed by someone other than Cap Anson and has long been considered non-genuine by a majority of dealers and collectors until PSA/DNA began issuing LOA’s for the questioned documents. In the early 1990’s, Bill Mastro purchased a large cache of documents from Anson’s granddaughter including genuine personal correspondence written by Anson to family members as well as many secretarial examples executed on documents related to Anson’s work as a Chicago City Clerk. Also purchased in the group were the secretarial signed vaudeville contracts which Mastro sold in his auctions as authentic as early as 1997 in a Mastro & Steinbach sale. Most of the Anson documents (authentic and secretarial) were purchased from Anson's granddaughter by Bill Mastro. 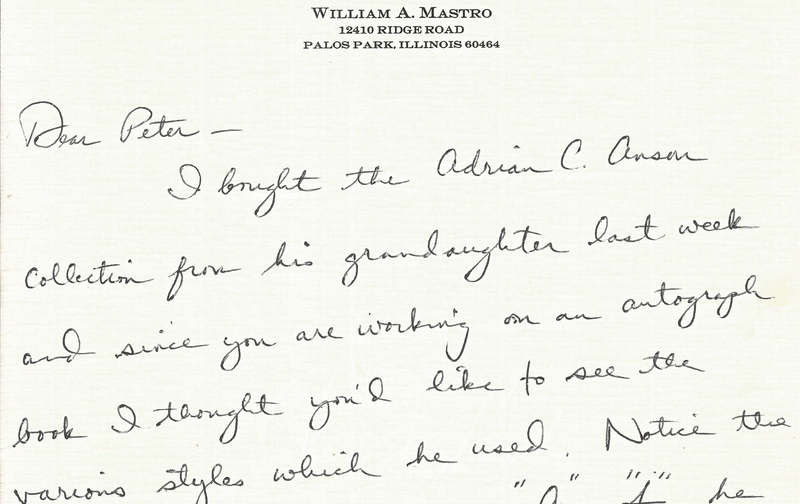 Mastro sent the letter (above) to this writer in the early 1990's revealing his purchase and the discussion of the "various styles" of his signature. On the left appear known authentic signatures of Anson ranging from (top to bottom) 1871 Rockford BBC contract (Illinois Hist. Society); 1883 (Chicago BBC Pay receipt), 1894 (Halper Hotel ledger), 1897 (ALS), 1906 Chicago clerk (ALS); 1906 (Herrmann Papers, NBL); and 1906 signature on card. 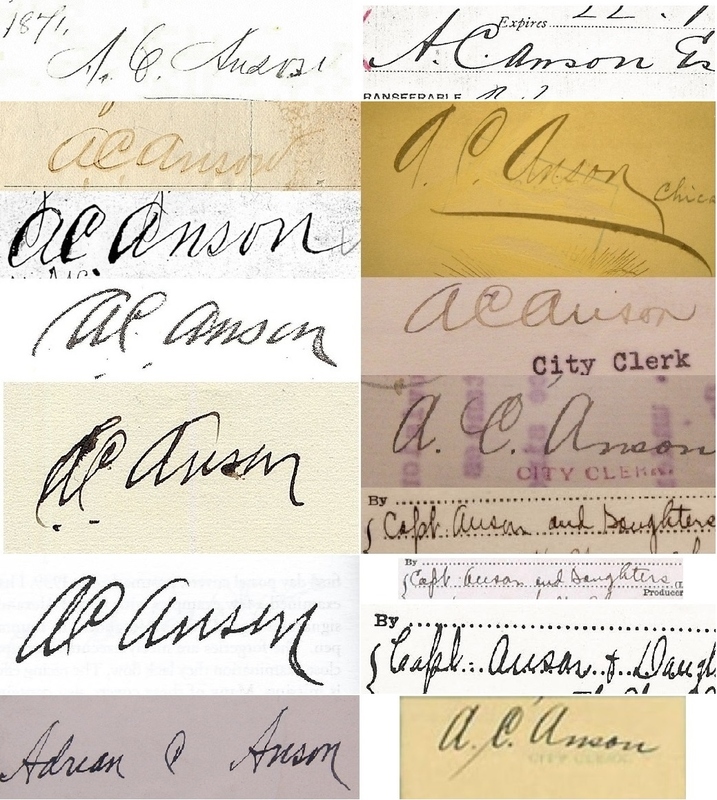 To the right illustrated are known non-genuine and secretarial examples of Cap Anson's signature including (top to bottom:1889 Membership to Marlybone Cricket Club; NYPL Stevens cabinet photo; (2) c 1906 Chicago city court documents; (3) 1918 theater contract signatures; City Court document cut-2004 Topps card. To illustrate Keurajian’s point it is useful to examine known genuine Anson signatures side-by-side with known secretarial examples. One noteworthy characteristic that appears to be found in almost all Anson signatures, regardless of the era in which it was signed, is the way Anson never closed his “o” at the end of his last name. The slant ans spacing between letters is also very consistent throughout his lifetime. Upon close review, it is our opinion and the opinion of several experts we consulted with that the alleged signature on the stolen NYPL cabinet photograph and the alleged signatures on the 1918 theater contracts were not executed by Cap Anson. The prevalence of flawed authentications of Anson secretarial signatures is best illustrated by a 2004 Topps cut signature card featuring a non-genuine Anson cut from one of the Chicago City Clerk documents purchased by Bill Mastro. The non-genuine signature sold for close to $5,000 on eBay in 2004. An authentic cut signature of Anson was used for an Upper Deck trading card (left). A non-genuine Anson secretarial signature was used for a 2004 Topps Tribute-Cut Signature Edition trading card. The bogus signature cut from a Chicago court document sold for $4,504 on eBay in 2004. Considering our prior report about the alleged Mickey Welch signature on another stolen Stevens cabinet and PSA’s removal of that item from its “Autograph Facts” page, we can only surmise that Joe Orlando and Steve Grad actually believe the signature is an authentic Anson. Other PSA authenticators like Mike Gutierrez have even written letters of authenticity stating as much in the past. In 2005, Gutierrez certified the signature as authentic for his own MGA authentication company. For the Anson signature on the NYPL’s Stevens cabinet to be authentic, the identifications and inscriptions on all of the other Stevens cabinets at NYPL would have to have been executed by Anson as well, for every single one is written in the same hand. A comparison of each of those examples of handwriting illustrates this assertion definitively. None of the cabinet photos bear the signatures of the players depicted. 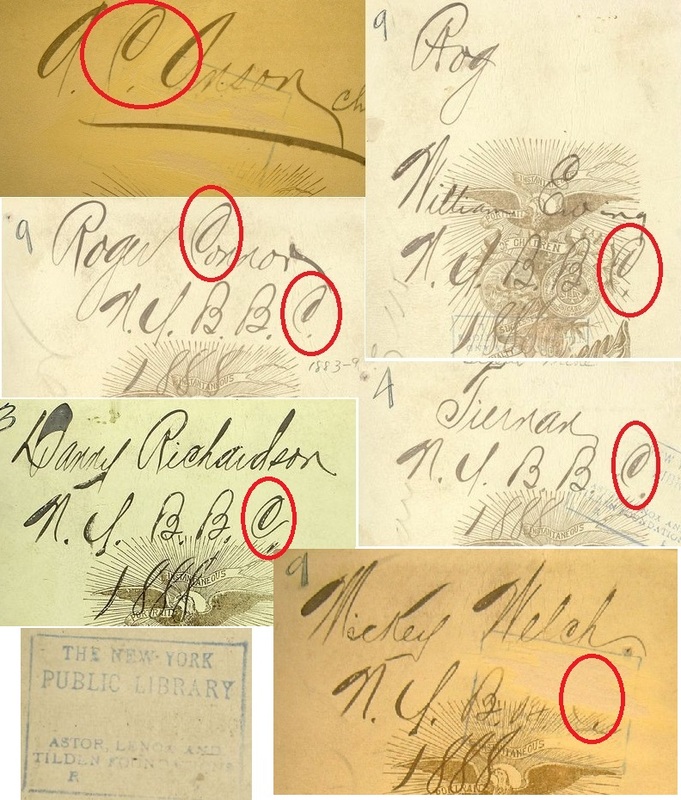 The alleged Cap Anson autograph authenticated by PSA was written by the same person who inscribed all of the NYPL Stevens cabinets as evidenced by the distinctive "C" found on the reverse of each cabinet photo. The evidence strongly suggests the person who inscribed the cards was not Cap Anson. The key to identifying the hand that executed each inscription is found in the distinctive capital “C” which is found in the alleged Anson signature and every other Stevens cabinet from the NYPL Spalding Collection. While PSA/DNA or Mike Gutierrez may argue that the writing on the back of the Anson cabinet is his actual signature, that opinion would have a better chance of being embraced if the other Stevens examples did not exist. It is likely PSA would argue that there are points of similarity in the Anson inscription and some authentic exemplars, but when examined in the totality of the multiple inscriptions it is clear that the handwriting bears no resemblance to the actual hand of Anson which can be examined thoroughly in surviving letters and correspondence. PSA’s authentication of the Anson secretarial signature and its continued support of its flawed opinion suggests that the authentication company continues to present counterfeit items as legitimate because prior sales were based upon a PSA opinion. Admissions of errors by the authentication company would likely result in a chain reaction of unhappy buyers and sellers requesting refunds and other relief via litigation. Sources indicate that PSA continues to support problematic opinions to protect its bottom line and its relationship with big clients like eBay and PSA advertisers who operate the major auction houses. Back in 2011, a report was published on this site alerting collectors that the Anson cabinet photo was stolen and asking anyone with information about the current whereabouts of the card to contact us. The article,Wanted By The FBI: Cap Anson, also reported that the signature on the card was not an authentic Anson and included an image of Mike Gutierrez’ LOA from 2004. Reports that the stolen Anson cabinet is still in private hands illustrates how ineffective the FBI’s four-year investigation into the NYPL thefts has been. Albert G. Spalding’s Stevens cabinet card featuring his pal Cap Anson is the quintessential hobby “hot-potato” and its journey through the hobby will be chronicled further in this writer’s upcoming book which will shed additional light on how this baseball treasure has passed through the hands of Spalding, the NYPL, Rob Lifson, Barry Halper, George Lyons, Lew Lipset, Walter Handelman, Mike Gutierrez, Dave Kohler of SCP Auctions and two others who returned the card to sellers when they found out the card was stolen. Those two parties were told the cabinet card was to be returned to the NYPL. Only the person currently in possession of the card knows if additional names can be added to this “Who’s Who” list of hobby notables. Nice job keeping an eye on the collection NYPL. So you do at least admit that it says Cap Anson? To the person who stole these from the library: You think this is all a big joke, don’t ya? Hippies burning library cards. Abbie Hoffman telling everyone to steal books.